Describe the action of logic gates. • AND, OR, NAND, NOR, NOT, XOR and XNOR. Understand the use of universal gates. 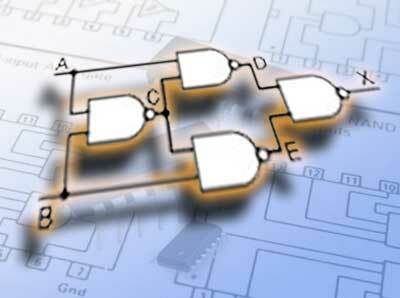 Recognise common 74 series ICs containing standard logic gates. Fig. 2.1.1 illustrates a selection of the basic logic gates that are available from a number of manufacturers in standard families of integrated circuits. Each logic family is designed so that gates and other logic ICs within that family (and other related families) can be easily combined, and built into larger logic circuits to carry out complex functions with the minimum of additional components. Typically, standard logic gates are available in 14 pin or 16 pin DIL (dual in line) chips. The number of gates per IC varies depending on the number of inputs per gate. Two−input gates are common, but if only a single input is required, such as in the 7404 NOT(or inverter) gates, a 14 pin IC can accommodate 6 (or Hex) gates. The greatest number of inputs on a single gate is on the 74133 13 input NAND gate, which is accommodated in a 16 pin package. With Fig 2.1.2 you can check out the operation of the basic logic gates for yourself. The interactive animation allows you to choose any one of the 7 basic gates from the top bar and click switches A and B to test its operation. Use the animation to become familiar with the operation of each of the gates, comparing the results you see with the truth tables provided. To easily understand more complex digital circuits it is important to develop a good mental picture of the expected output from each gate for any possible input. Fig 2.1.2 also shows how the seven basic logic functions can also be described using a ‘truth table’ to show the relationship between the output (X) and all possible input combinations for inputs A and B, shown as a four value binary count from 00 to 11. Each diagram shows the input and output conditions for one of the seven logic functions in its two input form. Some types of gate however, are also available with more (e.g. 3 to 13) inputs. For these gates the truth tables would need to be extended to include all possible input conditions. Because gates are manufactured in IC form, typically containing two to six gates of the same type, it is often uneconomical to use a complete IC of six gates to perform a particular logic function. A better solution may be to use just a single type of gate to perform any of the logic operations required. Two types of gate, NAND and NOR are often used to perform the functions of any of the other standard gates, by connecting a number of either of these ‘universal’ gates in a combinational circuit. Although it may not seem efficient to use several universal gates to perform the function of a single gate, if there are a number of unused gates in one or more NAND and NOR ICs, these can be used to perform other functions such as AND or OR rather than using extra ICs to perform that function. This technique is especially useful in the design of complex ICs where whole circuits within the IC can be fabricated using a single type of gate. Fig. 2.1.3 a to g shows how NAND gates can be used to obtain any of the standard functions, using only this single gate type. a. Connecting the inputs of the NAND gate together creates a NOT function. b. Alternatively the NOT function can be achieved by using only 1 input and connecting the other input permanently to logic 1.
c. Adding the NOT function (an inverter) to the output of a NAND gate creates an AND function. d. Inverting the inputs to a NAND gate creates an OR function. e. Using a NOT function to invert the output of an OR function creates a NOR function. f. Four NAND gates (a single IC) connected as shown creates an XOR function (and a Quad NAND IC is about 15% cheaper than a Quad XOR IC). g. Inverting the output of the XOR function creates an XNOR function. Similar conversions can be achieved using NOR gates, but as NAND gates are generally the least expensive ICs, the conversions shown in Fig. 2.1.3 are more frequently used. The reason for such conversions is usually cost. This may not seem very useful since none of the basic 74 series ICs are expensive, but when several thousand units of a particular circuit are to be manufactured, the small savings in cost and space on printed circuit boards by maximising the use of otherwise unused gates in multi gate ICs can become very important.